Trying to start an orchard in the desert might sounds like a ridiculous idea. 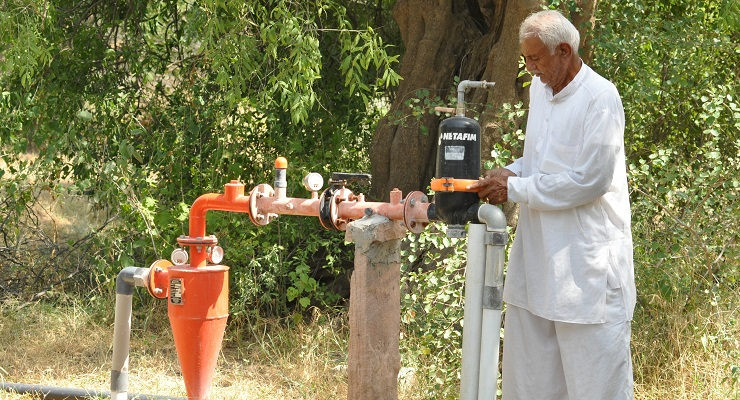 But 67-year-old Choga Lal Saini has worked against the odds, planting thousands of trees in India's Thar Desert. Trying to start an orchard in the desert might sounds like a ridiculous, let alone fruitless, idea. But 67-year-old Choga Lal Saini is the persistent type. For years he worked against the odds, in India’s Thar Desert, planting thousands of trees that have since borne fruit. Asia Calling’s Jasvinder Sehgal visits the unlikely farm. I am driving in a Jeep over hills of sand dunes in the desert town of Barmer. It’s a landscape made up almost entirely of sand, with the exception of a few desert bushes. Choga Lal Saini is my navigator and we’re heading to his unusual farm. Choga explains his unique endeavour. “This place is famous for desert, where sand and scant water doesn’t allow anything to grow,” says Choga. It’s a not an easy drive to the farm, the Jeep tires keep veering off into the sand. But finally, we reach the location. We are welcomed with a melodious song. Three women dressed in red and yellow traditional clothes are singing under a tree. “We belong to Vishnoi community and our God, Jambho ji has directed us not to cut trees and not to kill the animals,” says forty five-year-old Kamla Devi. “Our song means the same. We will commit a sin if we ever cut a tree or kill a bird or an animal. We can’t kill any living things,” Kamla explains. Choga is showing me around his 28-hectare farmland, it’s full of pomegranate, mango, jujube and Indian gooseberry trees. He has many medicinal plants too. “My gooseberries are the best,” Choga boasts. “I have grown them in the desert so they have special properties,” he says. “I myself had very poor vision and wore spectacles before. My knee joints use to give me a lot of pain, I could hardly walk. But after using the gooseberries, my vision is better and my joints have also recovered,” Choga told me. It was in 2001 that Choga Lal, a former clerk at the local administration, decided to develop his farm. He knew it wouldn’t be plain sailing. But overcoming the water challenge in the desert hasn’t been easy, admits Choga. When Choga first started the groundwater was completely pumped out after just 15 minutes from one well and after 45 minutes from the second well. But in 2006, the area that had seen spells of drought for decades saw floods. Plants flourished, and bore fruit. After succeeding against the odds, Choga is now aiming even higher. It’s evening now, and the birds are returning to their nests. Nests resting in the branches of Choga’s trees.